1. 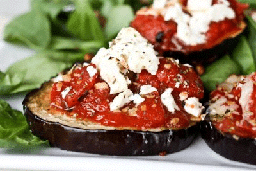 Slice eggplant into ½ to 1-inch discs. 2. Rub with olive oil and sprinkle with salt and pepper. 3. Bake for 20 minutes at 400ºF. 5. Add tomato paste and then pile on tomatoes. 6. Top with Garlic Gold, Italian seasoning, and cheese and bake another 10 minutes. 7. Let cool, serve, and enjoy!